I am doing a program that counts coins (and tells their value by their size) with OpenCV (C++). 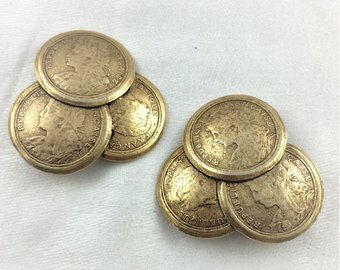 Let's say we have an image of some coins. 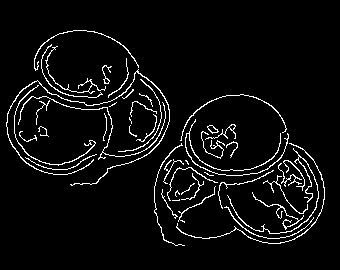 If there is an overlap of two coins at the same time, it is relatively easy to segment the coins doing the distance transform, thresholding so that coins are sepparated, doing a skeleton of the background, and then drawing that skeleton into the original image. What is the best way to detect 3 coins in that case? Hough circles? This question came from our site for computer graphics researchers and programmers. Segmentation is generally a process that is very susceptible to noise. I would better use a detector, especially for geometric shapes like coins. Remember, if you have a good detection, you also ease the segmentation problem dramatically. For the example of coins, a good model would be to use an ellipse: every circle/ellipse appears to be an ellipse under perspective projection, up to a negligible error. Luckily, there are many good methods that can detect ellipses without segmentation. ELSD is one, Hough transform is another. In a previous post, I have explained how to use ELSD to spot spherical particles. Now I will take the Hough transform approach - this results in a minimal code that works and which I will share below. This might also be more intuitive to understand. % that determines the number of detected ellipses and their grouping. % they should be somewhat less important. % now cluster the ellipses that belong together using x0,y0 only. To determine the cluster centers I use a median as this might be more robust than the mean alternative - you can try different things though. Let's look at the outputs of different steps. Of course this result is a rough detection. In other words, it is an outcome of voting and not an outcome of non-linear parameter refinement. To further improve these results, you can write an optimizer to snap the ellipses on top of the image edges. See here on descriptions of how to do that. You can also use ELSD edges instead of the Canny to ease the job of the Hough transform and to make the algorithm more robust. What are some easy to detect reference mark shapes and corresponding detection methods? How can I create polygon estimates of each body part/limb that is present in an image which always contains one person? How can I isolate a Hough circle that I perceive to be the best fit, but is ranked much lower?